There are some bands that you can see over and over again and the show doesn’t get old. There’s a certain rush you get when you see a concert and everything is on point. The band is on fire, the crowd is deafening and you know you’re in for the night of your life. Not many bands can do this time after time after time, but Skillet are one of them. Their last four albums have catapulted the band to a completely new level and their latest record- Unleashed– has already spawned the band’s first no. 1 single and there’s more in sight. Not long after the release, they hit the road for the Unleashed Tour with Sick Puppies and Devour The Day and the second leg of the tour just started and recently hit Indianapolis’ Egyptian Room for one of many sold out shows on the trek and the show didn’t disappoint one bit. The show kicked off with a powerful set from Devour The Day, with a large portion of the sold out Indianapolis crowd seeing the band for the first time- with no active Rock station in Indy, it’s hard for fans to know who the rising rock bands are- but they were blown away with DTD. With bassist Joey Chicago’s high-energy stage presence- if you haven’t seen him before, it’s amazing to watch- and frontman Blake Allison’s dominance, it’s a show that deserves more stage time than they usually get. Fans even got a chance to get up close and personal with Allison when we jumped into the audience and crowd surfed during “Save Yourself,” making it even more intense. At just two records into their career, Devour The Day are just getting started and are already one of the most dominant bands in rock and they’re only getting stronger. Next up was Sick Puppies, who hadn’t played Indy in awhile so the crowd was more than ready. With new frontman and guitarist Bryan Scott and a new album- Fury, the band has a fresh fire in them and it translated to the stage in Indy. With new songs “Stick To Your Guns,” “Where Do I Begin” and “Let Me Live” thrown into the mix with Sick Puppies classics, it was a well-rounded attack that saw Devour The Day singer Blake Allison joining them for “Stick To Your Guns” and taking the temp up even further with an attack that concluded with “You’re Going Down” and giving Skillet a run for their money. Then Skillet took the stage and all bets were off. They opened with “Feel Invincible” which led into “Whispers In The Dark” and “Sick Of It” and it was clear they were the most dominant band on the bill. 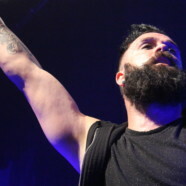 With the last few times Skillet came through Indy being on Uproar Festival, Winter Jam and a packed co-headline tour with Third Day that saw them playing just eight songs, it had been awhile since the Indianapolis Panheads had gotten a proper Skillet headline show and they took advantage of every opportunity to make it worth it. The setlist was loaded with a methodically-planned combination of tracks from Comatose, Awake, Rise and their new record- Unleashed, many of which featured extended intros and outros (“Rise,” “Out Of Hell” and “Undefeated” were just a few) and had an almost-theatrical feel to a lot of the songs.